Title: NYSW 3636 slowing down while crossing the hackensack river. Title: Side by side with 3636 @40mph!! Title: Blasting thru Pompton lakes i believe. Description: HO scale F45 just primered. Will be hacking up a sd45 for a new front end and adding some parts. Description: SU-99 with 3020, GCFX and CSX loaners fly over the ramapo river. Description: Got additional form d for full speed after passing derailment site. Description: In my mind the best looking yellow jacket of the fleet. Just needs a good wash. Description: With darkening skies, 3636 shoves east towards to make up the 99. Description: Heading back to the fuel track to couple with the rest of the power for tonights 99. Description: A classy looking unit, wish they had more. Description: On the rear it had "Best in Fleet Award", think its certainly living upto it. Description: The original BN green still showing. Title: NYSW 3636 in HO scale, its an FP45. At time of purchase didn't know there was a difference. Description: Still needs some more decals to be applied and another coat of darker green on the nose. Description: What is the su-99 is getting weighed and will be shoved east of the overpeck creek bridge. 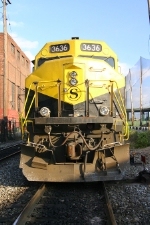 Title: NYSW 3636 will become the trailing unit on the 99. Description: Still the best looking locomotive in the fleet!! Description: NYSW 3636 is heading east too the turntable to be turned around. 3636 was the trailing unit and will now lead the 99. Title: NYSW 3018 is pulling east of one of the mc tracks so it can back down the main.